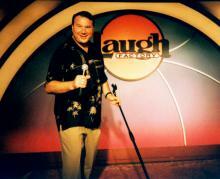 Jeff ‘Big Daddy’ Wayne–Rocking the Laugh Factory in Las Vegas with Rich Hall. What is better than a comedian who makes you laugh? How about three of them in a club that is designed to make it’s performers sparkle like jewels! This week The Laugh Factory at the Tropicana has hit the jackpot and for seven days you can enjoy three superb comedians for a ridiculously reasonable entrance fee. Life is good! 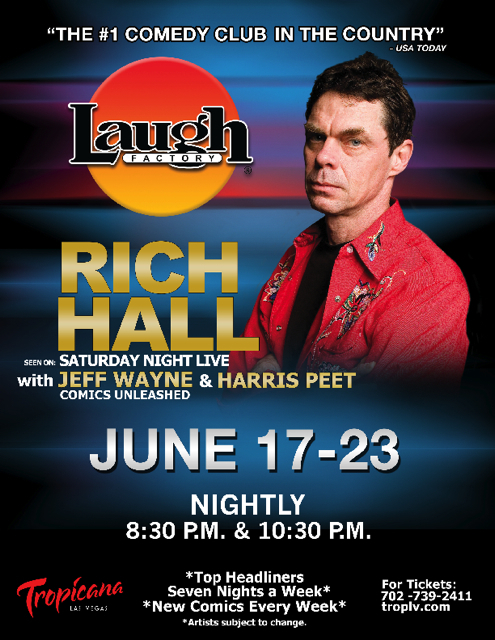 Headlining the bill is one of Saturday Night Live’s wryest alumni Rich Hall. Not only did Rich win the hearts and minds of American audiences but created something new under the sun–a ‘sniglet.’ Remember ‘sniglets’–any word that doesn’t appear in the dictionary but should. Rich had 5 ‘sniglet’ books published between 1984-9. Hall now spends much of his time living in England where he has a highly successful media career and retains high visibility in the comedy world. At the ‘Laugh Factory’ it will be the the pure distilled stand-up comedy of Jeff Wayne that will be entertaining the crowds in a full-throttled assault. Billed as ‘A troubled man for troubled times’ Wayne’s comedy gets laughs from topics as diverse as buying insurance from animated lizards on TV, psychic phenomena, Jerry Springer and maybe most relevantly– why exactly is Honey Boo Boo featured on the ‘Learning Channel.’ These do indeed seem to be troubled times on the face of it, however rest assured that with Jeff behind the wheel, your tour of such cultural phenomena will be a zero to 60 laughter outing, that will make you think, gasp and above all laugh. If you have never seen Jeff shred an audience at a comedy club then you owe it to yourself to enjoy the experience before you can only do so at theatre prices. When regular people ask me that “Who is your favorite comedian?” question, I can tell whether they know much about comedy by their reaction to my response “Jeff Wayne,”–if they have ever seen ‘Big Daddy’ then they just nod in immediate understanding. 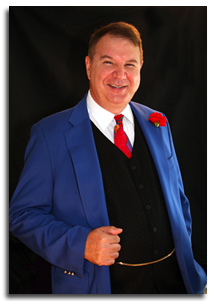 Jeff is one of the true comedian’s comedians, who is afraid of nothing and can draw laughs from topics that lesser comic might be nervous about tackling. Since he might read this article I won’t embarrass Jeff by describing him as one of the most unique genius’ in the comedy business–but he is. ~ by Nick Lewin on June 13, 2013.